The Explore Your City Uncover Sapporo Contest (sapporobeer.com/uncover-sapporo) is open only to legal residents of the 50 United States and the District of Columbia who are 21 years of age or older. 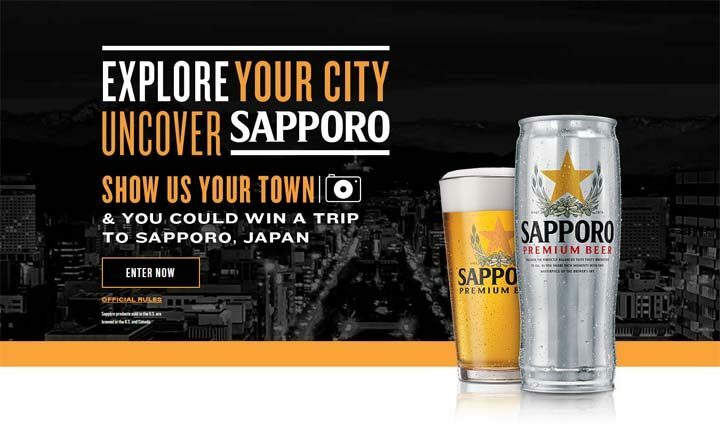 The Explore Your City Uncover Sapporo Contest ends at 8:59:59 AM PT on September 4. To enter, visit sapporobeer.com/uncover-sapporo, view the Weekly Challenge for that Week, and follow the website’s instructions to provide the requested entry information and to upload an original photograph that you have taken which aligns with that Week’s Weekly Challenge. All Social Shares must include the hashtag #UncoverSapporoContest. Completing a Social Share does not affect your chances of winning a prize. Limit (1) entry per person, per Week. Eleven (11) Weekly Prizes will be made available, each consisting of a TOKYO Citizen bike selected by Sponsor in its sole discretion. The approximate retail value of each Weekly Prize is $200. One (1) Grand Prize will be made available, consisting of a 5 night trip for winner and one (1) guest to Sapporo, Japan, including: round trip coach air travel for winner and one (1) guest from the major gateway airport closest to winner’s residence; double occupancy hotel accommodations for five (5) nights at a hotel selected by Sponsor; and a grand total of $1,000 awarded in the form of a check made payable to the winner to be used for meals, activities, and ground transportation. The total approximate retail value of the Grand Prize is $9,500.